In the early 1980s, there were three general elections within 18 months in Ireland. The country was in pieces: the economy ruined, most of the young talent emigrating, modern infrastructure barely existent, the North at war. Politics was dominated by Charles Haughey, leading a deeply-divided Fianna Fáil, and his nemesis, Garret FitzGerald, leading Fine Gael. Dublin’s inner city was almost destroyed by unemployment, heroin and urban planning, and entirely forgotten by the rest of Irish society and ignored by politics and the media. Fighting against this, community activists were struggling to assert another vision of society and politics. At their head was Tony Gregory, a young teacher turned city councillor, born in Ballybough, whose father had worked in the Docks. In the second of those three elections, in February 1982, Tony took a surprise Dáil seat – and suddenly found himself holding the balance of power. He was courted by both FitzGerald and Haughey. FitzGerald was a liberal, a man of modest disposition, and committed to a policy known as ‘the Just Society’; Gregory’s team liked his politics. And they disliked Haughey’s republicanism (Haughey had lost office a decade earlier for his involvement in a notorious scheme to illegally run guns to the IRA) and the whiff of corruption and ostentation that he courted. But Haughey was a northsider: he knew how to deal with people, and how to get things done. While FitzGerald remained aloof and remote, Haughey came to Gregory’s run-down office and drank with his team in the local pub. He impressed them with his knowledge of the area and his willingness to meet their demands. Over a series of three meetings, he seduced them, and they, in turn, succeeded in winning him over to perhaps the most radical anti-poverty scheme in Irish history. That became known as the Gregory Deal. Gregory voted for Haughey and he duly became Taoiseach – the deal was denounced by the establishment as flagrant vote-buying; its radical, progressive content was largely overlooked. Before much could be implemented, Haughey’s government collapsed, in November 1982, after a bizarre series of scandals. Some of the deal’s measures were adopted by the new government; others fell by the wayside. Thirty five years later, Dublin’s inner city is again the focus of national political attention and promises of investment; but such attention has proved fleeting in the past, and the promises insubstantial. ​Colin Murphy writes plays about politics, and journalism. He is the author of a series of plays on Irish political history: Haughey/Gregory, on the 1982 “Gregory Deal”, Inside the GPO, on the Easter Rising, Guaranteed!, on the bank guarantee of 2008, and Bailed Out!, on the subsequent crisis and Troika “bailout” of 2010, all produced by Fishamble. He adapted the latter two for screen, as The Guarantee and The Bailout (both produced by John Kelleher Media). He adapted the Charlie Bird book A Day in May for the stage. His verbatim dramas, Jack Duggan’s War and Judging Shaw (based on Fintan O’Toole’s book of the same name) have been staged by ANU Productions. His short film Leave to Remain was made for RTÉ Storyland (produced by Treasure Entertainment). He writes a weekly column for the Sunday Business Post. 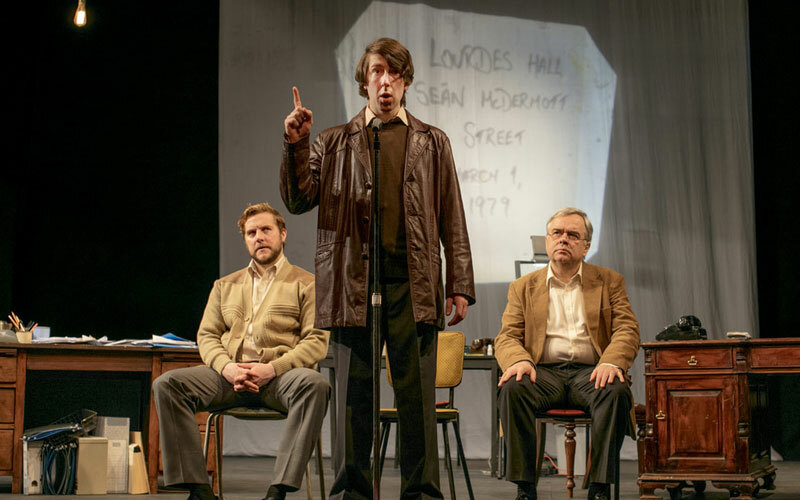 Haughey | Gregory can be seen at An Grianan Theatre on Tues 7 May 2019. Olivier Award winning production heading to An Grianán Theatre! We are delighted for Pat Kinevane and our friends at Fishamble who won an Olivier Award for their show Silent at last night’s awards ceremony in London. And even better news is that you can see Silent for yourself in just a few short weeks as we will have it here on Thursday 28 April! Silent tells the story of Tino McGoldrig, a man from the small Irish town of Cobh but living in Dublin, who is named for silent movie star Rudolph Valentino (‘Rudolph would have been a disaster in Cobh’). He is a homeless man who shares his story with passersby, describes the footwear of the pedestrians, and dances with a blanket representing his wife, fondly remembering their ballroom-dancing championships. “We’re gonna take Larry back to Dublin for a bit of a party!” Juliet Stephenson with Fishamble director Jim Culleton and performer Pat Kinevane at the Olivier Awards, 3 April 2016 (Photo from Fishamble’s Facebook). Challenging and provocative, funny and moving, physical and inventive, Silent showcases Pat Kinevane’s wicked sense of humour and highly theatrical imagination while simultaneously avoiding the pitfalls of becoming too worthy about the difficult topics of homelessness and mental health and the reluctance we have to talk about such issues. Silent was awarded the Olivier Award for Outstanding Achievement in an Affiliate Theatre following its run at London’s Soho Theatre last year. Founded in 1976, the Olivier Awards have become British Theatre’s most sought after award and are globally recognised as a mark of theatrical greatness. Thursday 28 April 2016 at 8pm. I was sitting in the theatre cafe one lunchtime enjoying the lovely food and chatting away to Little John Nee, who had popped in to eat as he often does when he’s in town, and he asked what shows we had coming up. I reeled off the list of upcoming Drama and John nodded along ‘good, good, that’s a fine show, good, good jeez it’s a fine season you have there’* Then I got to Fishamble and Pat Kinevane’s Silent and John became visibly animated, ‘That’s one of the best theatre shows ever, everyone should go see that’. *my apologies to John for any liberties taken in my representation of him chatting, I’m claiming artistic licence!